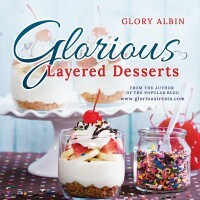 Glorious Layered Desserts Cookbook… it’s here!! Happy March!! This is a month I’ve been looking forward to for nearly a year…. 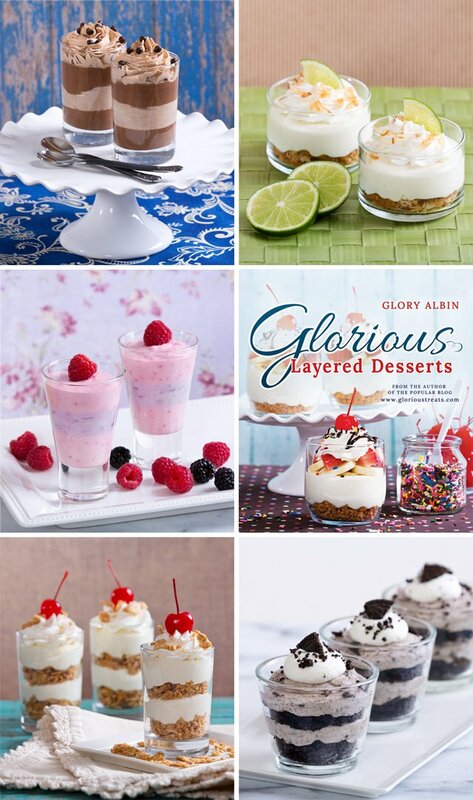 the month my cookbook, Glorious Layered Desserts, is officially available to purchase!! What an adventure it was to complete this book…. so many recipe notes, so much chocolate, so much cream, and a lot of love! Every recipe in the book has a full page image. I enlisted the help of a talented photographer friend, Gene Chutka. We had a lot of fun working together. He brought all of his photography equipment to my house and I would have a line up of desserts ready to go. I would set up a photo shoot, making sure there was just the right amount of crumbs, or drizzle, and then he would take the photo. We’d look at the photos together on his computer, make little adjustments to the set up, and then move to the next recipe. I’m sure it would have been funny to be a little mouse in the corner and hear our conversations… “Do you think there should be a few more sprinkles on that dessert?” “Are there a few too many crumbs on the right side of that plate?” Gene was very patient with me, and his eye for detail was a perfect fit with mine! The images in the collage above will give you just a little idea of the recipes in the book. 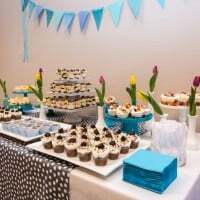 There are over 60 luscious recipes… from Chocolate Nutella Cream Dessert to Raspberry Blackberry Cheesecake Mousse, to Pumpkin Banana Caramel Trifle… I really think you’ll find something for everyone! In addition to the recipes themselves, I’ve included notes on ingredients, techniques, where to buy supplies, and recipe shortcuts. This book represents a lot of love, hard work, and a few tears! I am very proud of the final results. I am so looking forward to hearing reports from friends, family and all of you sweet readers, as you try the recipes and share them with the people you love. To purchase a signed copy directly from me you can find all the details HERE. I will be doing a bit of travel with the book as well, including Folsom-CA, Salt Lake City-UT, Topeka-KS. You can find a bit more details on those signings HERE. Thanks so much to each of you who follow this site, leave sweet comments and have already purchased the book! Your encouragement has meant the world to me! Congrats on the book! any giveaways? or trips to seattle? Oh, Glory! It looks beautiful! Congratulations! ! ! I’m going to love getting my hands on this book! Yayyy! Congrats! I’m purchasing one for sure! Congratulations, Glory! You must be both excited and so proud. This book looks wonderful, the desserts are impressive and the photography is amazing. I like the sound of the recipe shortcuts too! I’ve just checked on Amazon UK where we can pre-order as it will be available on the 11th March over here. My most sincere congratulations to you Glory! You are my favorite blogger and baker, and you are such an inspiration to me. I have already ordered a signed copy of your book, and cannot wait to try all the recipes! Thank you for all your hard work, and again, congratulations! SO EXCITED for YOU!!! Huge congrats, and hugs, too!!!! Thanks so much for your order! I believe they’ll be back in stock right away. CONGRATS on the release! Your hard work sure seems to have paid off! Congratulations! I can imagine how great this book will be! Congratulations on the book! I totally added the book to my wishlist! wow, would you look at this! Amazing, cannot way tot get my hands on some lovely recipes from you darling! I ordered mine last year – and it’s nearly at my doorstep! It feels like ages. Can’t wait to give some of them a go. Congratulations on completing your first book. It looks beautiful and no doubt it will sell extremely well (and quickly!) I can only imagine how proud you are. Sincere best wishes with it Glory. Congratulations! Such a fun idea for a cookbook. Yay! I’m so excited and happy for you! Congratulations! Congrats! Your book looks so fun and beautiful. You must be so tickled. Have fun with it! Superb blog! Do you have any hints for aspiring writers? I’m hoping to start my own website soon but I’m a little lost on everything. choices out there that I’m completely overwhelmed .. Any ideas? Cheers! Congratulations Glory!! That is a HUGE accomplishment, and every photograph of yours looks so polished and perfect. I promise nobody will ever be able to tell what your timeframe was like! I wish I was one of the people hanging out at your daughter’s school… I would’ve loved to sample your chocolate pudding! I’m a huge chocoholic, and I eat some after every meal. No joke! So exciting! Congratulations on the book! Having seen the book in person I can attest to the fact that it is gorgeous and amazing! I loved hearing your stories about the photo shoots Such an accomplishment! Congratulations Glory! 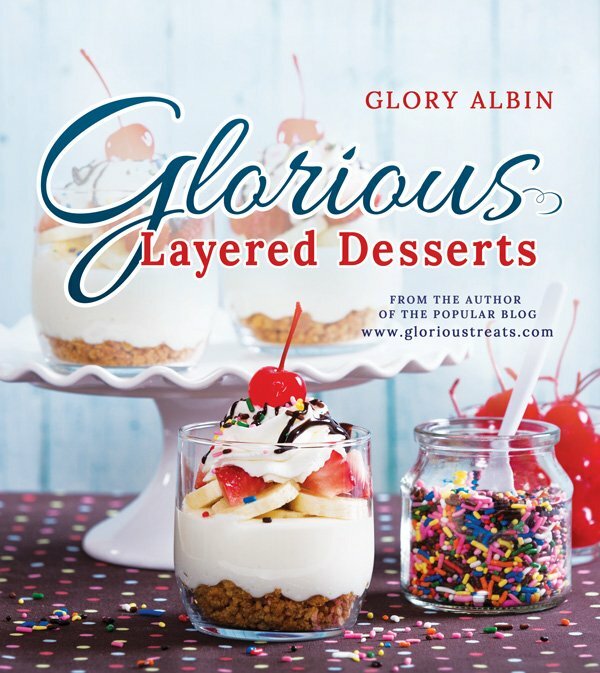 I just opened my Amazon package which contains my copy of Glorious Layered Desserts and I already cannot put it down! Everything looks delicious and I am very excited to start trying some of these recipes. Thank you in advance for all of my upcoming fun in the kitchen and most of all…CONGRATULATIONS on this amazing achievement!! Thanks so much for the sweet note Kara! Congratulations!!! Do you have any dairy-free recipes or options in the cookbook? Just picked up my copy at Barnes & Noble, it’s “beautiful” !!! Super excited to make these desserts. Yay, thanks! I haven’t made it to my local Barnes & Noble (since the release), so I’ve yet to see it on a store shelf! So glad you picked one up! Wow! Congratulations! The book looks fabulous! I just purchased the signed copy of your book! I cant wait to get it! I found your website about 2 years ago and have been coming back to it ever since. I first started making sugar cookies around the same time and have always used your recipe and everyone raves about my cookies, thanks to you! I always send them to your website for credit. I am so grateful that you have shared the recipes and tutuorials on cookie decorating. I wish you the best in your future, you are truly one of my inpirations! I just LOVE your work, you are sooo talented and gifted!